1. Schuessler WW, Schulam PG, Clayman RV, Kavoussi LR. Laparoscopic radical prostatectomy: initial short-term experience. Urology 1997; 50:854. 2. Vallancien G, Cathelineau X, Baumert H, Doublet JD, Guillonneau B. Complications of transperitoneal laparoscopic surgery in urology: review of 1,311 procedures at a single center. J Urol 2002; 168:23. 4. Guillonneau B, Vallancien G. Laparoscopic radical prostatectomy: initial experience and preliminary assessment after 65 operations. Prostate 1999; 39:71-75. 5. Hoznek A, Salomon L, Rabii R, et al. Vesicourethral anastomosis during laparoscopic radical prostatectomy: the running suture method. J Endourol 2000; 14:749. 6. Frede T, Stock C, Rassweiler JJ, Alken P. Retroperitoneoscopic and laparoscopic suturing: tips and strategies for improving efficiency. J Endourol 2000; 14(10):905-914. 7. Gill IS, Zippe C. Laparoscopic radical prostatectomy: technique. Urol Clin N Am 2001; 28(2):423-436. 8. Guillonneau B, Vallancien G. Laparoscopic radical prostatectomy: the Montsouris technique. J Urol 2000; 163:1643-1649. 9. van Velthoven RF, Ahlering TE, Peltier A, DW Sharecky, Clayman RV. Technique for laparoscopic running urethrovesical anastomosis: the single knot method. Urology 2003; 61:699-702. 10. van Velthoven RF, Peltier A. Prostatectomia radical laparoscopica en espece humana. In: Prostatectomia Radical Laparoscopica. Caceres, Spain: Centro de Cirugia de Minima Invasion, 2003:173-204. 11. van Velthoven RF, Peltier A, Laguna MP, Ahlering TE. Technique for laparoscopic running urethrovesical anastomosis: the single knot method [abstr]. J Endourol 2003; 17(suppl 1):MP15-MP21. 12. Walsh PC. Anatomic radical prostatectomy: evolution of the surgical technique. J Urol 1998; 160:2418. 13. Türk I, Deger S, Winkelmann B, Schönberger B, Loening S. Laparoscopic radical prostatectomy. Eur Urol 2001; 40:46-53. 14. Cuschieri A, Szabo Z. Laparoscopic hand-sutured and stapled anastomoses. In: Tissue Approximation in Endoscopic Surgery. Oxford: Isis Medical Media, 1995:113-139. 15. Cestari A, Guazzoni G, Riva M, Nava L, Rigatti P. Use of the laparoscopic knot introducer in urethrovesical anastomosis following radical prostatectomy. Tech Urol; 5(3):152-154. 16. Igel TC, Wehle MJ. Vesicourethral reconstruction in radical retropubic prostatectomy: an alternative technique. J Urol 1999; 161:844-846. 17. Kamerer A, Basler J, Thompson I. Novel technique of vest suture vesicourethral anastomosis in a morbidly obese patient undergoing radical retropubic prostatectomy. J Urol 2003; 170:174. 18. Novicki D, Larson T, Andrews P, Swanson S, Ferrigni R. Comparison of the modified vest and the direct anastomosis for radical retropubic prostatectomy. Urology 1997; 49:732-736. 19. 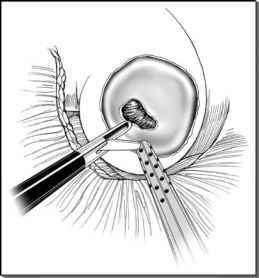 Saito S. Modified reinforcement for vesicourethral anastomosis after radical prostatectomy. Br J Urol 1997; 80:147. 20. Mimata H, Kasagi Y, Sakamoto S, Nomura Y. A simple technique for vesicourethral anastomosis in retropubic radical prostatectomy. Urol Int 1998; 61:232-234. 21. Yamada Y, Honda N, Nakamura K, et al. New semiautomatic device (Maniceps) for precise vesicourethral anastomosis during radical retropubic prostatectomy. Int J Urol 2002; 9:71-72. 22. Yamada Y, Honda N, Nakamura K, et al. Vesicourethral anastomosis suture placement during radical prostatectomy using Maniceps. Urol Int 2003; 70:181-185. 23. Escandon AS, Garcia RG. Use of a laparoscopic instrument to improve urethrovesical anastomosis quality during retropubic radical prostatectomy. Tech Urol 2000; 6(1):39-41. 24. Guillonneau B, Rozet F, Cathelineau X, et al. Perioperative complications of laparoscopic radical prostatectomy: the Montsouris 3-year experience. J Urol 2002; 167:51-56. 25. Price DT, Chari RS, Neighbors JD Jr., Eubanks S, Schuessler WW, Preminger GM. Laparoscopic radical prostatectomy in the canine model. J Laparoendosc Surg 1996; 6:405-412. 26. Nadu A, Salomon L, Hoznek A, et al. Early removal of the catheter after laparoscopic radical prostatectomy. J Urol 2001; 166:1662. 27. Waninger J, Salm R, Imdahl A, et al. Comparison of laparoscopic handsewn suture techniques for experimental small-bowel anastomoses. Surg Laparosc Endosc 1996; 6:282-289. 28. Catalona WJ, Carvalhal G, Mager D, et al. Potency, continence and complication rates in 1870 consecutive radical prostatectomies. J Urol 1999; 162:433. 29. Popken G, Sommerkamp H, Schultze-Seeman W, et al. Anastomotic stricture after radical prostatectomy: incidence, findings and treatment. Eur Urol 1998; 33:382-386. 30. Borboroglu PD, Sands JP, Roberts JL, Amling CL. Risk factors for vesicourethral anastomosis stricture after radical prostatectomy. Urology 2000; 56:96-100. 31. Kostakopoulos A, Argiropoulos V, Protogerou V, et al. Vesicourethral anastomosis stricture after radical retropubic prostatectomy: the experience of a single institution. Urol Int 2004; 72:17-20. 32. Rassweiler J, Sentker L, Seemann O, Hatzinger M, Rumpelt HJ. Laparoscopic radical prostatectomy with the Heilbronn technique: an analysis of the first 180 cases. J Urol 2001; 166:2101-2108. 33. Hoznek A, Antiphon P, Borkowski T, et al. Assessment of surgical technique and perioperatrive morbidity associated with extraperitoneal versus transperitoneal laparoscopic radical prostatectomy. Urology 2003; 61. 34. Menon M, Tewari A, Peabody J, et al. Vattikuti institute prostatectomy: technique. J Urol 2003; 169:2289-2292. 35. Menon M, Hemal A, Tewari A, et al. The technique of apical dissection of the prostate and urethrovesical anastomosis in robotic radical prostatectomy. BJU Int 2004; 93:715-719. 36. Ahlering TE, Sharecky D, Lee D, Clayman RV. Successful transfer of open skills to a laparoscopic environment using a robotic interface: initial experience with laparoscopic radical prostatectomy. J Urol 2003; 170(5):1738-1741. 37. Ahlering TE, Woo D, Eichel L, Lee D, Edwards R, Sharecky D. Robot-assisted versus open radical prostatectomy: a comparison of one surgeon's outcomes. Urology 2004; 63(5):819-822. 38. Albani J, Steinberg A, Sharp D, et al. Laparoscopic radical prostatectomy: analysis of 3 urethrovesical anastomotic techniques [abstr]. J Endourol 2003; 17(suppl 1):MP15-MP22. 39. Katz R, Nadu A, Olsson LE, et al. A simplified 5-step model for training laparoscopic urethrovesical anastomosis. J Urol 2003; 169:2041-2044. 40. Nadu A, Olsson LE, Abbou CC. Simple model for training in the laparoscopic vesicourethral running anastomosis. J Endourol 2003; 17(7):481-484. 41. Sanchez C, Kibanov V. Chicken as the experimental model for practicing of the urethrovesical anastomosis during laparoscopic radical prostatectomy [abstr 329]. Eur Urol 2004; 3(2):85. 42. Laguna MP, Alcazar A, Mochtar CH, van Velthoven R, Peltier A, de la Rosette JJ. Chicken training model for laparoscopic radical prostatectomy suture: an internal validation. J Enduro 2006; 20(1):1969-1974. 43. Roca A, Passas J, Sanchez F, Tejonero M. Prostatectomia radical laparoscopica en el cerdo. In: Prostatectomia Radical Laparoscopica. Caceres, Spain: Centro de Cirugia de Minima Invasion, 2003:125-159. 44. Katz R, Antiphon P, Hoznek A, et al. Cadaveric versus porcine models in urological laparoscopic training. Urol Int 2003; 71(3):310-315.